While the Ironman season is about to kick off in the Northern Hemisphere, it’s gradually coming to a close in Australia. Ironman Australia is the penultimate chance to qualify for the 2014 Ironman World Championship Down Under. It’s a long standing race, 29 years apparently, but with only 40 slots on offer may not offer the best odds of qualification. How does it compare with the other Antipodean Ironman races? Usually I start by looking at the distribution of split times from a number of years of results, but I’m going to open with my more detailed age group reviews in the box below. These PDFs provide far more information than the aggregated data that follows, breaking down the charts by age group and individual year and also providing lists of top age group splits. 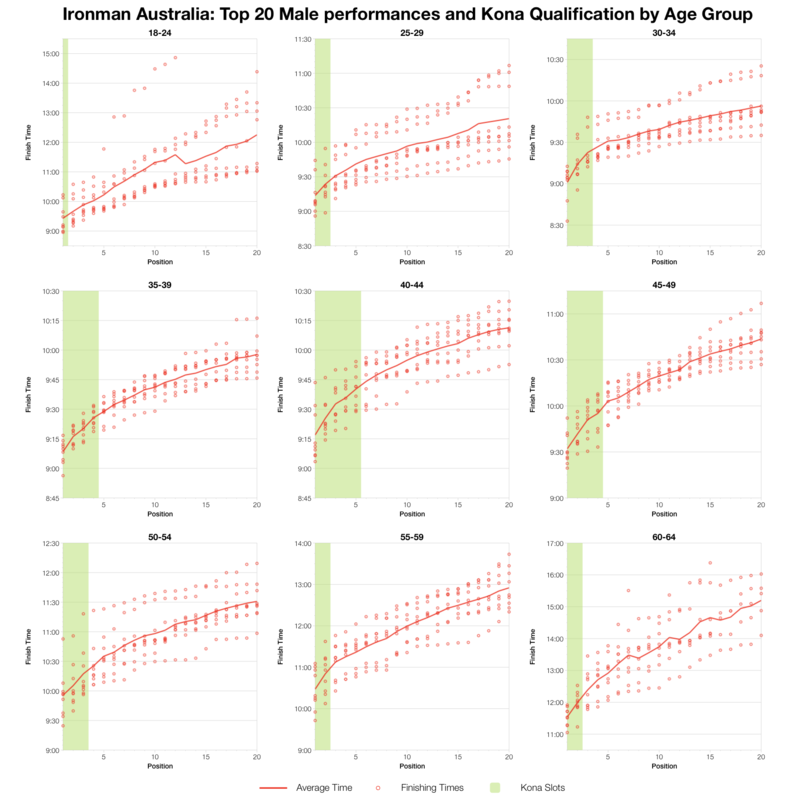 Age group specific Ironman Australia results analysis. 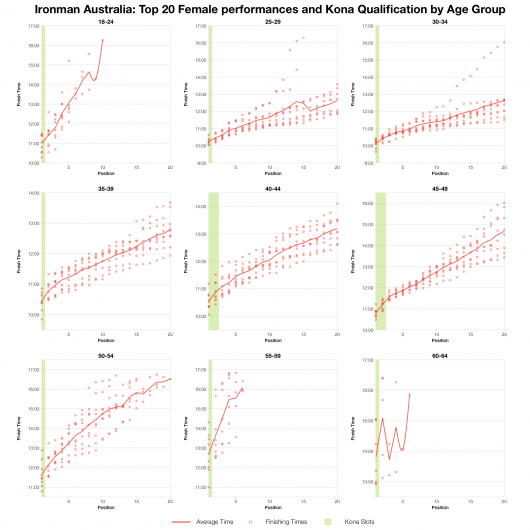 More charts and more detailed timings and splits for top age grouper and Kona qualifiers. They are still a work in progress and take time to produce – hopefully they’ll prove useful to some. On to the summary analysis. 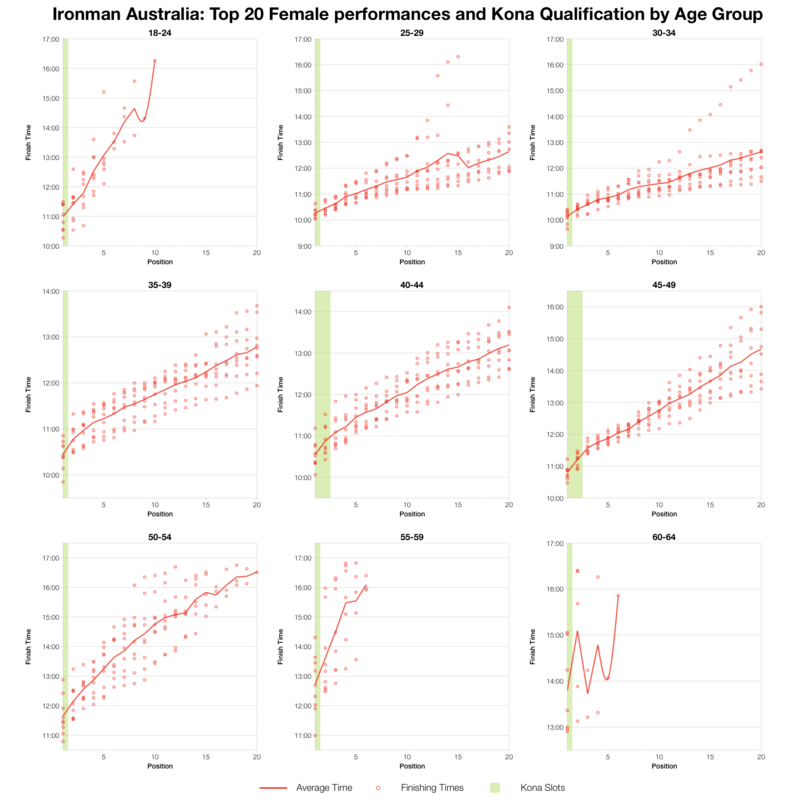 So the usual comparison of distributions – 9 years of results from Ironman Australia compared to all Australia/New Zealand race results in 2012. 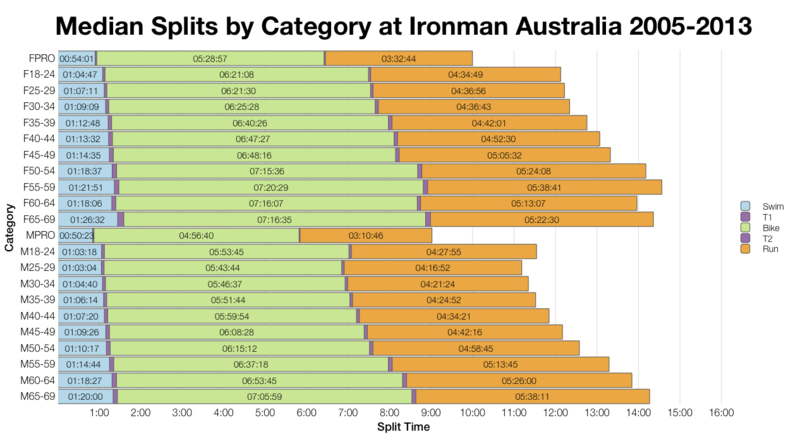 The latter grouping is simply to give a rough guide to typical performances Down Under, it should be noted there is a lot of variability between the races included. 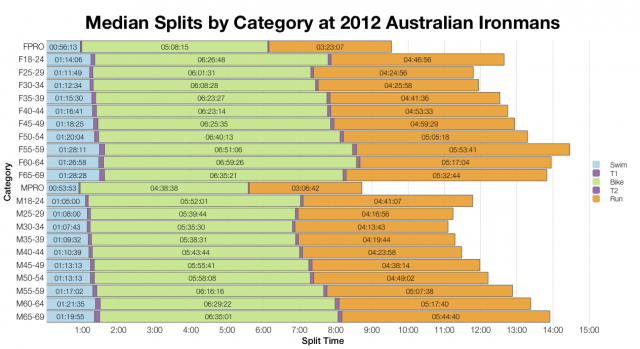 That said Ironman Australia seems broadly comparable to the 2012 charts. The similarities are repeated when we compare the median splits for various categories – differences are small and generally not significant. 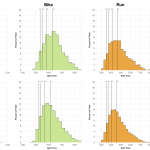 It’s probably worth looking more closely at the professional times which point to a faster swim, but slower bike and run than some of its counterparts. 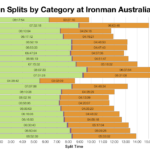 I’ve taken the athlete list from Ironman.com and used the numbers to calculate the above estimate of slot allocation. As ever final allocation will be entirely dependent on start numbers on race day and may vary from the above, but it does give a reasonable guide to where the slots will go. No surprise that M40-44 dominates. 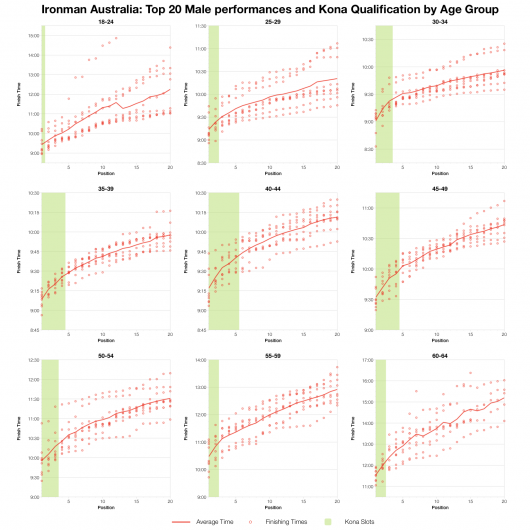 The final piece of analysis work is a look at the top twenty performances in each age group over the last 9 years (you can see a more detailed version in the detailed PDFs up top). Generally the results are quite consistent without any particular year standing as an outlier – sometimes the race is faster, sometimes slower, but the gaps from first to second and so on back remains largely the same. That means that while it may vary most of the major male age groups are looking at around 9:30 for a shot at qualification. For the women those times lie somewhere between 10 and 11 hours, but generally that means winning your age group. Usual post race analysis will follow on Monday or Tuesday of next week (depending on how busy my long weekend is).